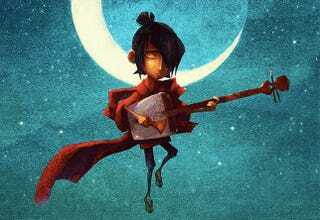 LAIKA's next movie Kubo and the Two Strings is centered around Japanese folktales. Already the creators are promising "mystical origami" and that is something I would very much like to see from a LAIKA production. Today, LAIKA announced the title and premise of their new film. In a press release, it stated that LAIKA President & CEO Travis Knight will be making his directorial debut on Kubo and the Two Strings. The new movie, from an original screenplay by Marc Haimes and Chris Butler (ParaNorman) is a sweeping, swashbuckling adventure set in a mythical ancient Japan. It is being brought to life at LAIKA's Oregon studios via the company's innovative 3D stop-motion and CG hybrid technique. In addition to directing, Mr. Knight is producing Kubo and the Two Strings with Arianne Sutner (ParaNorman). The all-star voice cast includes Academy Award winners Matthew McConaughey and Charlize Theron; Academy Award nominees Rooney Mara, Ralph Fiennes, and Brenda Vaccaro; and Art Parkinson, who plays Rickon Stark on Game of Thrones and who is providing the voice for the title character of Kubo. In the epic fantasy, scruffy, kindhearted Kubo ekes out a humble living while devotedly caring for his mother in their sleepy shoreside village. It is a quiet existence – until a spirit from the past catches up with him to enforce an age-old vendetta. Suddenly on the run from gods and monsters, Kubo's chance for survival rests on finding the magical suit of armor once worn by his fallen father, the greatest samurai the world has ever known. Summoning courage, Kubo embarks on a thrilling odyssey as he faces his family's history, navigates the elements, and bravely fights for the earth and the stars. The voice cast has already been set as well. Matthew McConaughey, Charlize Theron, Rooney Mara, Ralph Fiennes, Brenda Vaccaro have all been cast, but we're not sure what their roles are yet. Art Parkinson (Game of Thrones) is voicing the lead character Kubo. That's a pretty powerful cast and crew behind it at this stage. However, we do hope to see some Japanese creators involved down the line. "A gripping yarn woven from Japanese folktales and mythology, with lost civilizations, mystical origami, noble heroes, star-crossed lovers, and blood-curdling monsters. At once epic and intimate, Kubo is a funny, intense, and ultimately uplifting fairy tale draped in some of the most bizarre and exciting imagery I've ever seen. Most importantly, it's deeply moving. It's a story that means something, a story that deserves to be told. In short, it's a LAIKA movie. And with a poetic script, sublime cast, and our freakishly talented artists and craftspeople, Kubo will be a strange, stirring, and altogether stunning film. I can't wait to share it with the world." And if that means we're going to see LAIKA's take on origami, we could be getting some pretty spectacular visuals in the future.